Book this tour to fully enjoy the beautiful "momiji" season in Japan! Momiji means autumn leaves in Japanese. As Tokyo is so big and diverse that it is difficult to go around on your own especially in the momiji season, it's really difficult to know where is the best spot to see beautiful autumn leaves. Your time is limited, but if you want see it all, this is the perfect way to see them. Explore the highlights of Tokyo on this 8-hour small-group tour by minivan. It combines a bus tour with short walks with a professional and friendly English-speaking guide. Visit Tokyo’s top attractions such as Tsukiji Fish Outer Market, Shibuya Crossing and 2-3 top view spot such as Rikugien garden, Jingu-Gaien , the University of Tokyo and more in just 8 hours. A knowledgeable local guide will help make your day in Tokyo easy, safe and fun. Your Tokyo minivan tour begins at 9am by meeting in front of the Tsukiji Honganji Temple in the central Tokyo. Then, you'll walk to the Tsukiji Fish Market to explore Tokyo's kitchen and learn how local people get fresh seafood. 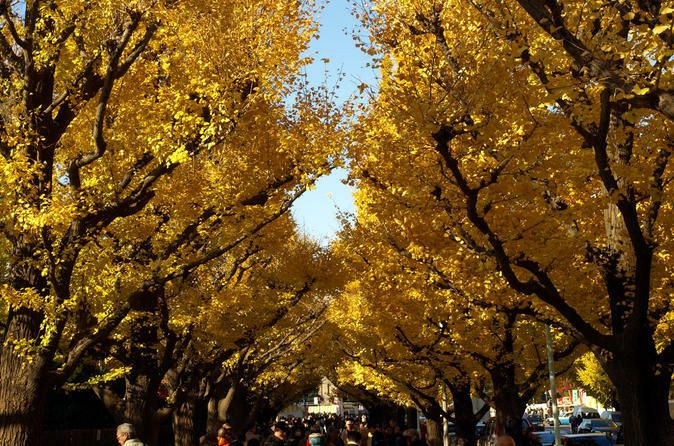 After seeing the Tsukiji Fish Market, you'll proceed to the Rikugien Garden and enjoy beautiful autumn leaves.Then you will move to the university of Tokyo, known for its beautiful ginkgo trees. Later, you'll enjoy some lunch and then move to the west side of Tokyo. Visit Jingu-Gaien, one of the most popular momiji spots in Tokyo, and stop by Shibuya, known for its crowded intersection. The tour concludes at your original departure point around 5:00 pm.